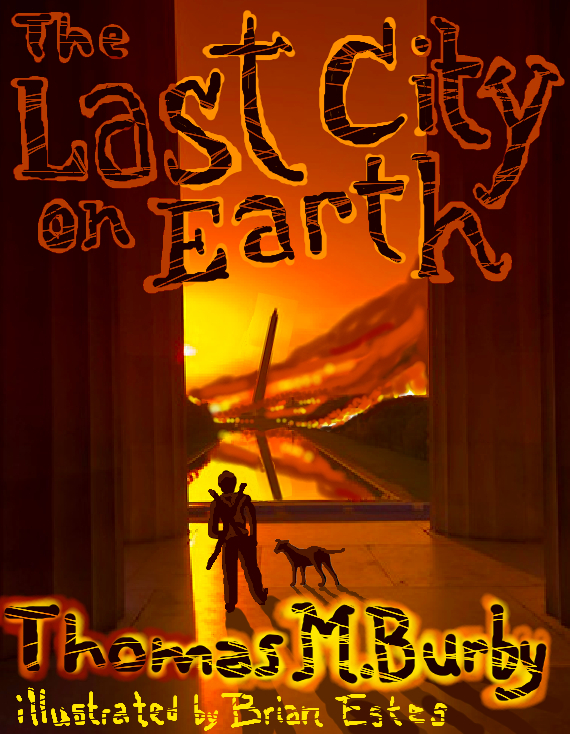 So I begin to share the next volume of The Abandonment, The Last City on Earth. We begin with new characters to join Brady and his friends on their quest to find the cause of the avian flu and gather the survivors to start over. I would like to introduce you to Owen and his spirit guide, Spike. Life’s good friends are hard to find…when most of the world has died. More to come, on a weekly basis. If you like what you see, let me know. Mock-up of the cover of the new book by illustrator Brian Estes. Who are you? he heard the voice whisper. What do you remember? the voice asked. I don’t believe you. But that’s the way of things these days. Don’t worry. I am sending a messenger, or if you would rather, a guide. Follow him and do as he says. If you follow him, you will meet the one who will give you your name. Then you will understand what needs to be done. Everything will make sense after you discover who you are. The voice, he thought, came from two places at once, both from within a spot in the deep center of his mind and from a place impossibly far away. If the Universe had an edge, this voice would have come from it, billions of years ago, only to reach his mind at this moment. It sounded young and old, ugly or strangely beautiful and childlike, all at once. What is your name? he asked in thought. A cackle, a choking laugh and a giggle mixed to form a strange brew of joy and from it came the answer. Too many names to recall. You have no name. I have thousands. But we are of a kind, you and I. Now, it’s time to wake up to the wide world again. Follow my servant and he will lead you to the one who can name you. Her voice was a leaf blown like a thousand others by a wind from the highest cloud. He tried to say more but he knew it was too late. Under the blackness of his eyelids, he glimpsed a woman and a small child, a long black road, and a light rising from between two mountains, piercing the night. Then, as suddenly as the last vision, another flooded his brain. This was different – a long journey, a tree on the edge of a pool and a rope, hanging there loosely in the stillness of an empty world. But he wasn’t alone – no – there was a woman with him, an old hag of a woman standing on the edge of water, laughing. And what was that in her hand? Could it be? No, certainly not an eyeball in her hand, being held like a child might hold candy. Then there was blackness and he was again on the hard concrete of a back alleyway, alone. Pain pierced his side as he opened his eyes and took notice of his surroundings. He was lying on the ground near a dumpster on his belly as though he had dropped from the sky into a world that was not his own. The rising damp and his own soaked clothing told him that it had been raining. The smell of his own body repelled him and he wondered how long he had been without a bath. He thought something was wrong, something out of place. What was it that so out of kilter? He moved his hand to his face and touched the black patch that rested over his right eye. I only have one eye? he wondered. He lifted the patch but no light entered his brain and his field of vision did not change. He was blind in that eye, or there was no eye from which to see. He tapped the spot gently where his eye should be: nothing. He could not remember losing an eye. Then he realized he couldn’t remember much about anything. At all. Then he saw the creature that had been foretold walking slowly and nonchalantly toward him. From his perspective on the ground, it looked much larger than it would have if he had been standing. It sashayed toward him with the elegant pace of a dancer. For some strange reason, he dared not move. When it reached him, it put its nose directly against his and sniffed, barely touching. Then it began to purr and writhe around the man, coaxing him upwards and awake. He reached up and held onto the side of the dumpster. He could barely lift himself into a standing position and his legs burned with pain. Steadying his body, he forced himself to concentrate on the act of standing upright and forgetting that he might have been lying in that alley for much longer than a few hours. Meanwhile, the little black and white cat kept a safe distance without skittering away, remaining close as though it was waiting for the man to make up his mind. “I’m coming, little guy, I’m coming,” he managed to say, as though he needed to communicate with the cat to begin their relationship. His voice was deep like a man who ate gravel on a regular basis. How strange, he thought, that she would send a cat. But somehow, he thought a cat to be the best of all possible guides. They were tough and they were lithe and more than anything else, they could make it on their own. Cats walk through the worlds, he remembered from some long forgotten conversation in another life. This little cat seemed to be in good shape and he noticed that it had a line of fine white hairs that stuck up into the air along the ridge of its back, like the dorsal ridge on a crocodile. The cat was urging him to the edge of the alley and into the main street. “I think I’ll call you Spike,” he said, a smile creeping onto his face despite the pain in his back and the weakness in his legs. He did not know who he was, but he knew that he hadn’t smiled for months now, not since the advent of the bird flu that had killed so many, including…no, he did not know who he was, so he did not know who it was that he had loved and lost. He remembered drinking an ocean of alcohol and he remembered losing his grasp on reality until…but then it all went haywire and a dull gray and now he was following a little runt of a cat for no other reason than because he had heard a woman in his dreams foretell a guide. What am I doing? he wondered. This didn’t make any sense. Who in their right mind would follow a cat in a world that had already fallen apart and trying to kill him simply because he had survived when everyone else hadn’t? Owen? He heard someone say a name – Owen. Silence and then again, Owen. Did the cat just say the name Owen? Of course the cat must have said meow but cats don’t just say meow anymore than dogs say bark or cows say moo.That’s what children are taught but that’s not the sound that they actually make. Cats say dozens of things besides meow. Owen? the cat said again. Clearly, he thought, this cat did not meow. This cat owened. “Did you just call me Owen?” he asked. Spike looked up at him and blinked and though he knew that most cats have a Cheshire grin painted onto their cute little faces, this one truly seemed to be smiling, purposefully. “Owen will do for now,” he said, reaching down through the pain to pet the little creature, whose back arched up to meet his hand and whose constant movement slowed for a moment to let the man stroke him. “Which way?” he asked, as they left the relative darkness of the alley. The cat started walking slowly down the ruined road, past crashed, burned out cars, narrowly avoiding the rotting corpses of the dead residents of the town. Shop windows had been smashed and the remains of civilization were left in ruins. Chaos had reigned here for awhile and Owen, for that was the name he had been temporarily assigned by the cat, remembered enough of his past to know that hell on earth had fallen, followed by the long silence of forever. It was good to not be alone.He was glad to have a companion, even if it was a little black and white cat, sent by the ancient voice of a crone who lived in his head.